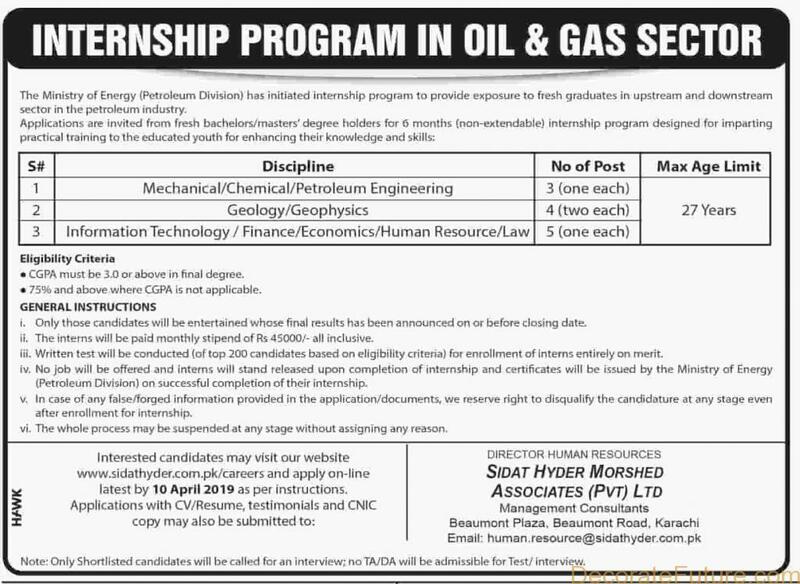 Applications are required from Ministry of Energy (Petroleum Division) for Ministry of Energy Internship Program 2019 in Oil and Gas sector. The Ministry of Energy (Petroleum Division) has initiated internship program to provide exposure to fresh graduates in upstream and downstream sector in the petroleum industry. Applications are invited from fresh bachelors/masters’ degree holders for 6 months (non-extendable) internship program designed for imparting practical training to the educated youth for enhancing their knowledge and skills. Only those candidates will be entertained whose final results has been announced on or before closing date. The interns will be paid monthly stipend of Rs 45000/- all inclusive. In case of any false/forged information provided in the application/documents, we reserve right to disqualify the candidature at any stage even after enrollment for internship. The last date to Ministry of Energy Internship Program 2019 in Oil and Gas sector is 10-April-2019. Only Shortlisted candidates for Internship Program in Oil & Gas sector by Ministry of Energy (Petroleum Division) will be called for an interview. No TA/DA will be admissible for Test/ interview.